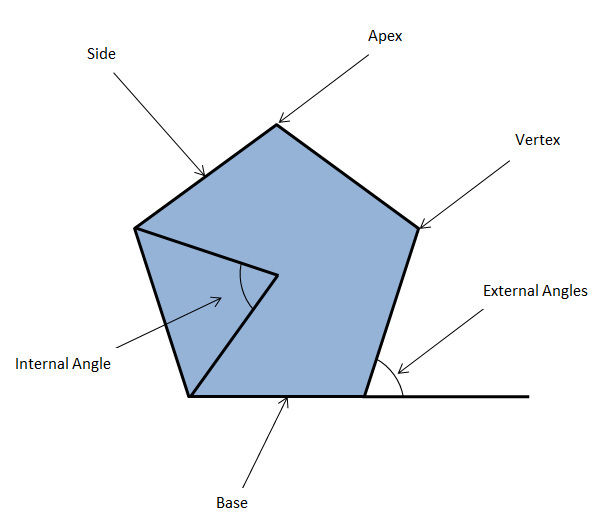 Apex - Once you have selected the base line of your polygon, the vertex opposite that base line is called the apex. Base - For any given polygon, one of the sides can be distinguished as being the base. It is not particularly important which one is chosen. The usual practice is that when you draw a polygon, the side that is horizontal or closest to horizontal is considered to be the base. Base Anlges - The base angles are the two angles created at the base line. Again these completely depend on which line you call the base line. Internal Angle - The interanl angle of a polygon is found by joining two vertices to the centre of the polygon. It is key that these two vertices are next to each other. The angle that these two lines form at the centre of the polygon is called the internal angle. You can calculate this angle if you know how many sides you want your polygon to have. For example if you wanted a 6 sided polygon, you divide 360 by the number of sides (6) which gives you an angle of 60°. The exterior angle will always be the same as the interior angle.